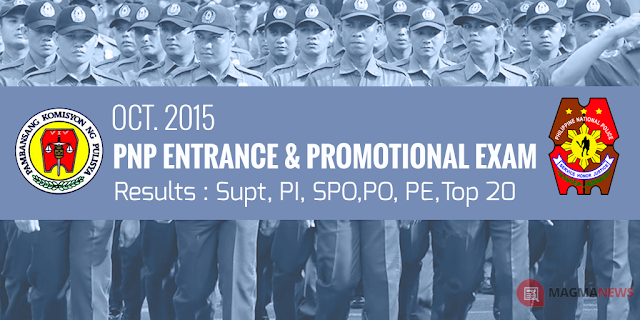 List of Passers : Oct 2015 Napolcom Entrance, Promotional Exam #PNP #NAPOLCOM - Exam News, Reviewer, Military Career, & Everything [MN] . .
Manila, Philippines - The National Police Commission (NAPOLCOM) announced the official results of the October 2015 PNP Entrace and Promotional Exam through their webpage on January 9, 2015. NAPOLCOM administered the PNP entrace and promotional exam comprising 34,919 examinees in at least 24 testing centers nationwide namely: cities of Makati, San Fernando (La Union), Tuguegarao, Angeles (Pampanga), Cabanatuan, Malolos (Bulacan), Aurora (Baler), Tarlac, Calamba, Bacoor, Calapan, Legazpi, Iloilo, Cebu, Tacloban, Pagadian, Dipolog, Cagayan de Oro, Davao, Mati (Davao), Koronadal, Baguio, Butuan and Cotabato. Some 14,860 joined PNP entrance exam while 20,059 took the various promotional categories which include Superintendent, Police Inspector, Senior Police Officer and Police Officer exam. The three-hour entrance examination for PNP entrance covered questions on general information, verbal reasoning, quantitative reasoning and logical reasoning while the promotional examinations include general information, police administration and operations, and police customs and tradition/values and ethical standards. The National Police Commission conducts two cycles of police examination every year. This includes Promotional Exam (for those who already in the police service) and another is PNP Entrance Exam (for those aspiring to enter PNP).